Mt. Koya and its surroundings are a UNESCO World Heritage Site. Home to over 100 temples, Mt. Koya has been the center of Buddhism Shingon, an important Buddhist sect, for over 1200 years. 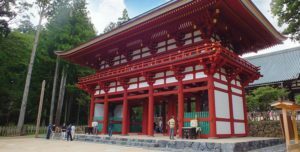 The journey to the mountaintop religious center of Mount Koya (Mt. Koya) is one of the highlights of the visit. Your guide will meet you at your Kyoto hotel and take you by private car to Nanba station in central Osaka, where you will board together one of the most scenic trains in Japan, winding your way up through the mountains. After disembarking you will take a short cable car ride up to the top of the 900m Mt. Koya. Your expert guide will show you around Mt. 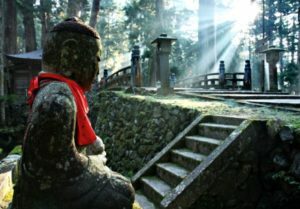 Koya’s sights, as well as give you an insight into Japanese Buddhism. Visit Kongobunji Temple, the head monastery of Shingon Buddhism, and home to Japan’s largest rock garden, as well as the Garan temple complex. 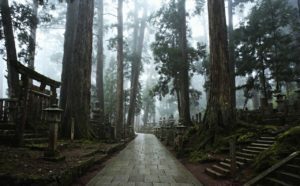 Okunoin is Japan’s largest cemetery and holds the mausoleum of the founder of Shingon Buddhism, Kobo Daishi. The 2km walk to the mausoleum takes you past 200,000 tombstones, belonging to feudal lords, prominent monks and well known Japanese companies. Tonight you will be staying at a shukubo – a Buddhist temple lodging. These rooms are comfortable, but simple and not luxurious. However, this is the best way to immerse yourself in the authentic, spiritual atmosphere of Mt. Koya. Dinner tonight is shojin ryori, a traditional Buddhist cuisine. This vegetarian meal is not only healthy but delicious! can make the journey at any time you wish, before proceeding to your next destination.